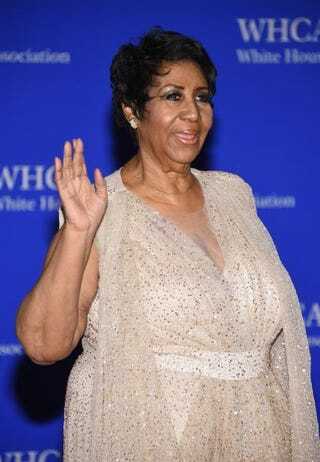 Aretha Franklin attends the 102nd White House Correspondents’ Association dinner April 30, 2016, in Washington, D.C.
Over the weekend, the stars were out in Washington, D.C., for the 102nd White House Correspondents' Association dinner, as well as for International Jazz Day. Hosted by President Barack Obama and the first lady, International Jazz Day included performances by artists such as Wayne Shorter, Herbie Hancock, John McLaughlin, Robert Glasper, Aretha Franklin, Sting and Esperanza Spalding. Franklin opened the show with a performance of Leon Russell's "A Song for You," but halfway through the event, she took time to honor and remember Prince by performing "Purple Rain." "He was definitely an original and a one-of-a-kind. There was truly only one Prince," Franklin said in an interview after Prince's death. "He put his stamp [on his sound]. Prince is gone but his music lives on." Franklin added, "There was a mystique about him that made you want to know a little more about him. Kind of like Stevie [Wonder], he was one of those artists that loved to go into and stay in the studio." Take a look at the short performance below.